Now that Fox is having it's Cosmos: A Spacetime Odyssey Sunday at 9pm, they could simulcast The Good Wife I guess, unless they also have Cosmos. 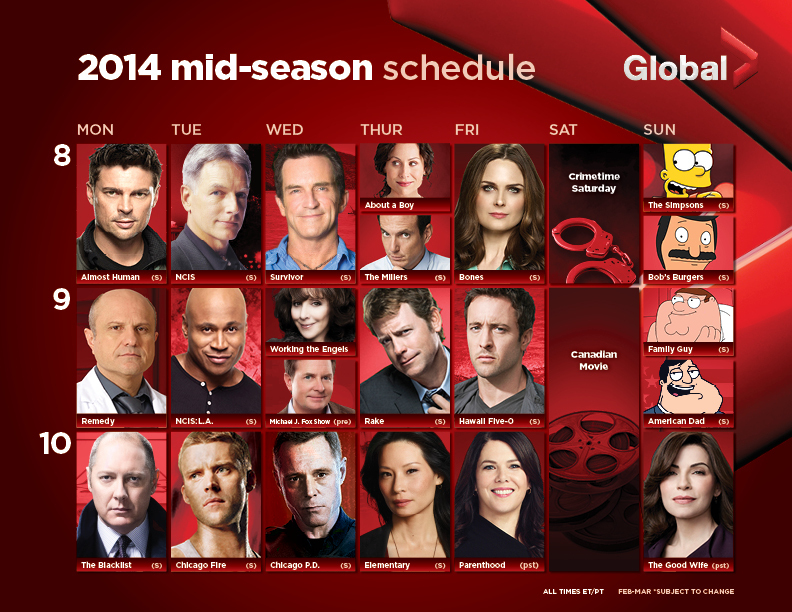 Well, except for Rake and Chicago PD, Global's winter lineup is the same as the fall. Remedy and Working The Engels wont premiere until after The Olympics but exact premiere dates have not been confirmed so they aren't going to put out a press release without premiere dates. They did put out a PR announcing the return dates of series returning this January like Almost Human, NCIS, Bones, Hawaii Five-0, etc. Same with specialty, most of the premieres are not happening until after The Olympics. Much of their lineup will be pre-empted in February because of The Olympics. Not just NBC stuff like The Blacklist, Chicago Fire, The Michael J. Fox Show, etc.. but CBS is holding back Survivor while The Millers and Elementary will both be in repeats. FOX is really the only network going all out against The Olympics this year. About A Boy Thursday at 8pm, probably post-NBC. Yeah, About a Boy will be post-release. NBC just announced a few days ago it's airing on Tuesdays at 9:00PM against NCIS Los Angeles, Global will air it Wednesdays at 9:30PM.The premiere airs on Global Sunday February 22nd at 10:00PM. They do have it, and it will now air Sundays at 9:00PM with The Good Wife remaining at 10:00PM. Although i'm not sure how long FOX is going to stick with this lineup. I kind of understand their thinking as they will dramatically improve 7:00PM with new episodes of Bob's Burgers and American Dad as opposed to repeats and will probably see gains in the 8:00PM hour with Family Guy joining The Simpsons so if this hits then they will have 3 solid hours of programming but they are taking a big risk putting on something quite different in a pretty high profile time slot and if it doesn't do well I could see FOX quickly returning to the old schedule, 9:00PM Sundays isn't really a time slot I see FOX being patient with. Looks like Global decided to program a rerun of Chicago PD at 8pm on Jan 27th. Last edited by InMontreal; 01-16-2014 at 12:26 PM. Michael J Fox Show has now been cancelled, and Bones moves back to mondays at 8pm starting March 10th on Fox after Almost Human ends its run. Last edited by InMontreal; 02-06-2014 at 08:48 AM. So GLobal has to find a 30 minute show for that slot. Not sure they have anything. They could always have The Exes, which is not bad, to replace it. If they still have the rights that is. They may have dropped it since they haven`t shown since season 1. And I think they didn`t even show the full 1st season. Global has picked up Growing Up Fisher from NBC. Growing Up Fisher will premiere in simulcast with NBC Sunday February 23rd at 10:30PM before moving to Thursdays at 8:00PM in POST-Release NBC. Also, Global will not be waiting for NBC with Working The Engels, and will premiere the show March 12th in advance. Last edited by TVViewer; 02-10-2014 at 04:17 PM.